The sales page promised me results, it felt good, so I went for it. I quickly realized that what I had bought was just like any other course out there. The difference? Packaging. At that very moment I looked back and thought about the thousands of dollars I’d spent on courses like this without using them. “I’m not cut out for this” I thought, and silently gazed at the sky, hoping for a miracle. But that miracle never came, at least not in the form I expected it to come. I desperately wanted to succeed. I wanted to start doing what I loved, but it wasn’t working. I was all over the place; buying new products, but doing nothing with them. It’s not always about you when you read the salespage and get caught up in the latest product launch. Your buttons are being pushed, and you may not even be aware of it. You may feel drawn towards the products, and it just feels good to buy. Robert Cialdini talks about this at great length in his book Influence: The Power of Persuasion. This basically means that we unconsciously create all these internal triggers that help us navigate what seems to be an increasingly confusing and fast-paced outside world. These triggers can then be used to manipulate you. But if you know what’s going on, or are even aware of the fact that sales pages and launches are made to get you into a buying mood, then you can step back, and make a real decision. Even now, when I’m doing fairly well, I still get caught up in product launches. I still want to buy everything that comes out. But I don’t really need 99% of the products out there, so I don’t buy. Simplicity is essential for me. I keep my focus on as few things as possible. And that’s what you should be asking when you’re thinking about diluting your focus. You can keep collecting information, but it won’t do you any good if it isn’t relevant, and if you aren’t going to use what you learn. I wish I could magically get you to understand this, but sometimes it takes a while. It took me almost two years, so hopefully not that long, otherwise I’ve completely failed with what I’m doing here. Totally resonated with this one Henri. I’ve easily spent $8000 this year on marketing programs and I’ve yet to navigate completely through any of them. I keep saying that I should spend half a day cataloging everything I have and set up a schedule to go through it over the next year or so yet I can’t even get to that step. The fact is, there is a fair amount of redundancy amongst products in a given genre, just as there are on genre blogs. I’d be better off had I selected either Chris Guillebeau’s work, Dave Navarro’s, Naomi Dunfords, Danielle Laporte’s, Jeff Walker’s etc….but selecting all the above? All I got was overwhelmed and out of cash. So, I guess my lesson from this is, maybe I should apply minimalism to my marketing efforts, my business expenses, and my learning tools. Novel thought, eh? That usually helps clarify it all for me, and I never end up buying anything anymore, because I’m already so deep in what I’m doing! But look at the bright side. Now that you’ve got all these products, you don’t have to buy them anymore, so you can think about which one is relevant to what you’re doing, and apply that until you’re crushing it! Sometimes it takes time, but when it finally hits home, it’s not exactly something you’ll forget anytime soon. It wasn’t until I jumped in the pool, and started doing my best that I started getting some clarity, but it happened slowly at first, and as I failed, failed, and failed, I also learned. It’s not an easy journey, but it’s definitely worth it. I think we’re probably all familiar with having our “buttons pushed” by a crafty piece of copywriting. But frankly, I’ve seen so much of it, that I’m quite jaded with it all by now. Most sales letters are a total turn off for me. Agreed. Although I’m fascinated by marketing, so I like reading sales letters, even though there are many that use their skills for evil out there. Your being so very honest is a trait that sets you apart. Great post on minimalism. Your insite on this subject is like a breath of fresh air. Once we achieve minimalism it leaves many new doors open for us. I find that for myself learning all of the technical things of operating a blog seems to be slowing down my progress. I taught myself to create sites in Dreamwever. Now I find that WordPress is the popular bloging tool, or is it? Then setting up methods of receiving payment and on and on in the learning of the technical aspects of making a living from the knowledge I want to share. I would love to find all of this information in one place at a price that doesn’t require that I liquidate all of my minimalist posessions and live homeless on the street. Learning all of the requred steps and programs to use is a huge investment of time. I feel like I am walking this path blindfolded and stumbling around trying to find the correct method and tools. Henri, your writing about your feelings and trials as well as what you have learned along this path is helpful. Thank you. WordPress is the most popular blogging platform that I know of. And as for the information, there are some great places that I know of. I’ll shoot you an e-mail! I suppose we are all afraid of missing something we think we should know and that is whey we keep going after these new products when they launch, but as you rightly say, most time its just the packaging thats different. I suppose this is something we all must go thru especially as new IMers. Your post on minimalism helped a lot and I also think being specific helps too. Focus is extremely important but difficult to develop. Hopefully I can reach this point before “giving up.” Is that an option? I dont think so, not for me. Anyway take care and to your success. If you keep going, I think sooner or later you’ll start knowing what works, and what doesn’t, even if you aren’t seeing the monetary rewards yet. How interesting that I´m reading Influence right now. It´s such a life changing book. I wish all people had access to the information in it, freely. Instead, it looks like the marketers have all the information to influence us and manipulate us while we are not aware about the mechanisms they use. Nice that you are spreading the word, Henri. Everybody should read this book, more than to influence people, to be aware of how others use tactics of influence to make us buy and believe in things. It’s definitely a great book. I’ve read it a few years ago, so I’m re-reading it now. This post kind of jumped out at me and settled in my heart. I’ve been thinking about issue this for a few years in a vague, abstract way. It’s been really bugging me for months. For the past two weeks I have actually noticed myself having a grip on this pattern and proactively taking charge of the rabid consumer within me. I’m so glad you wrote this post when you did. It landed at just the precise moment it was needed. It feels good once you reclaim control, especially when you start seeing results! Until you have done your (un)fair share of buying, you don’t learn the lesson. So many of us have been there. What I’ve learnt and what I would say anyone should do is, for every product you buy, you should achieve at least one measurable result with what you have learnt, before you go out any buy another product. This is the case in the internet marketing niche because there is still so much brouhaha about it, it is still seen as an quick and easy opportunity for everyone. But if you look outside of this niche, and you put yourself in the shoes of a customers who wants to buy an information product online about something else, doesn’t matter what, who probably hasn’t really bought much stuff online, except maybe clothes, food or tickets, that isn’t entering internet marketing niche, they won’t spend so much money on bad products or products they won’t use because a new version came out two months later. well seeing as right now I bring home around $400+ for a whole month. Buying anything online that I can not use right now…clothes, books, food or whatever else I find online (mostly amazon.com) is a waste of time & money for me. Yes sir, Stella! I think some of us have to go through that in order to get the lesson out of it. Like you said, it’s a great way to think of it as an investment, or to get something out of it. But you can get all the books you want and still spin your wheels. If that happens then it is up to you alone to figure out what’s wrong, or even ask someone to help you. Keeping focused on what you’re after is important. I myself am re-reading your passionate living book and really thinking about what I want to focus on most. I’m dealing with multiple “likes” that I want to venture into but I realize that going all in will not work if I want to succeed and become better than I already am. Every launch doesn’t matter because each launch offers something different. Keeping focused on one thing that matters right now and feels right will get you one step closer to where you want to be. Otherwise you may end up wasting a lot of time looking around every direction never finding what it is you think you’re after. What worked for me was to pick ones of my “likes” and go with that. Once you’ve got one going, you can always start another, but you can’t start them all at once. I will admit though, I too admire their ability to attract us to that shiny object. I would have to say, they are reaching their goal by tapping into a challenge or need that we have, but the guarantee on most every product is YOU DOING THE WORK. That’s where most people fall off the wagon. They stop doing the work because they aren’t getting the bulleted, check-marked, red bolded achievements the sales page promised, as fast as they thought. Then they quit. Again, whatever we need, it’s already on the inside of us. We have to commit to using what we already have to keep from being overwhelmed. Great post (as always Henri)! Thanks for the kind words, and thanks for reading. I really appreciate it, Fon. Yes sir! For me it all started with finding what I was passionate about, once I had that clear I could eliminate a lot of options, because it wasn’t what I wanted to do. When you’re just thinking about making money, then it becomes overwhelming, because there are thousands of ways to do it. When we get too caught in the latest things to help us succeed we forget one thing. All wee need is our brains and desire to work hard. All else will come. Don’t get caught in the lime-light to buying. Its pointless. Just master a craft, create a master piece millions will love and go further. Yes! If you’re determined, you can make pretty much anything happen! Well, that was both refreshing and a slap in the face. Of course, in all honesty, I think I need both. I’ve been jumping on bandwagon after bandwagon in hopes of finding a solution to the debt I accumulated in failed business effort after failed business effort. The burden and pressure of the bills has been driving my behavior just as much as my online “if-it-sounds-like-it-will-make-me-money-product” buying addiction. Your word…FOCUS…that’s something I’ve known for years and years but literally lost focus on. Sometimes you need to go through what you go through in order to get where you want to get. Sales pages can be so inviting. There is no point buying stuff you will not use or need. Most of the stuff out there is garbage. Get yourself to the point where you really need something badly before you buy. Buy based on your priorities. If you’re committed and consistent at what you do, reading the top blogs in your niche and applying what you’ve learnt, it will surely carry you far. I buy tools that will do a particular task and ease my job than ebooks. We all have the resources we need at our disposal. Make good use of what you have and keep your FOCUS. Yup, don’t buy anything you’re not going to take massive action on. 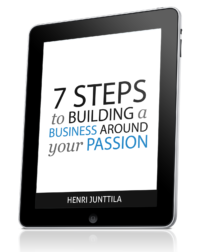 Henri, This is so well written and reveals such an important truth about how to achieve one’s goals. Thank you for this timely reminder. Thanks a lot! I’m beginning to like shorter articles, where I force myself to cut out anything unnecessary. What most people don’t realize is that the vast majority of successful online marketers and bloggers have spent 2 years or more trying to figure stuff out. The people who failed the most are the people who end up doing the best. That being said, I have a friend who started Internet Marketing 6 months ago and he is profiting $5k a month already. How he did it? He spent around $10k on education courses, but not the cheap $100 ebook how to make money online. No, He went to the best of the best (guys like Eban from doubleyourdating.com) and he bought courses from them which cost $2000 each. Oh yeah. If you have the money, and you’re willing to take action, those high-level courses are fantastic, at least from guys like that. Thanks for commenting, Diggy. Always cool to hear your thoughts! I’ve spent thousands over the last 4 years on products and courses, and have been disappointed in most of them. I think hooking up with the right group made all the difference for me. I’ve never found any products to deliver like they promise. I wish I hadn’t wasted all that time! Thanks for the great article Henri. It’s all about finding what works for you, and you seemed to have done that, which is awesome! There are a lot of people pushing overpriced, rehashed material that they don’t themselves apply to their online business. Most “gurus” don’t practice what they preach. They make their money selling you systems that they’ve never used and that don’t really work. If someone ever tries to sell you on a $1,500 product, please ask yourself what kind of education you could buy with that money. Because here’s the secret: The gurus don’t have any special secrets. Everything you need to know is pretty much available for free. What you’re paying an Ebook author to do is teach you that information quickly so you don’t have to spend months of trial and error figuring out what works. At any rate, if you want to know what’s really going on with the “Big Guns” of internet marketing, go check out saltydroid.info and search for “The Syndicate.” You’re being lied to by some very big names in the industry. As for Henri, I did some writing for him a few years back and can personally vouch for his integrity. Great to see you, Eric! If you have the money to spend, there are some great programs out there, like Diggy mentioned above. The good thing about many programs is that they eliminate overwhelm, and give you all the information in one place. But again, there are no real secrets out there, so you don’t need to buy anything if you don’t want to. Aloha Eric! Hmmm seems the Emperor has no clothes! Mahalo for the info. PS We are lied to by the big names and all the little names who learned from them!! I think I may have picked up on that meme as well. You seem to be narrating my life as it happens! My tendency is to over complicate the process of simplifying, maybe out of habit? I jumped at the Minimalist book sale, read some of them, then turned around and just bought another one with almost identical content! Thanks for bringing me back to reality. The book sale was an amazing opportunity, so I don’t fault you for jumping on that. We all fall off the horse. Just by realizing what’s going on, you’ve already plugged your guitar to the amp and getting ready to rock! The minimalist sale was incredible, and I’m glad I jumped at the chance! I’m not glad that I kept jumping at other stuff, when I already had enough. Sorry if that seemed like I was dissing the sale. Quite the opposite! My whole thought process was changed as a result. Henri, I have only just discovered your work and your blog, after you began to follow me on Twitter today (thank you). What you describe above is exactly what I am doing right now! Madly chasing after each new launch, collecting new ideas and saving “useful” resports – and yet not really applying what I am learning. Even before reading your post today I have been decluttering and unsubscribing – and now I will be even more ruthless with this. So thanks for the timely reminder and the heart-felt inspiration. Thank you – and I wish you all success. Good to see you here. I’ve been seeing you here and there, and your stuff always seems top-notch, so you’re definitely on the right path. But as we all know, nothing happens until we start taking massive action. Sometimes you need that cluttered phase to realize what you really want. Thanks for stopping by, and thanks for making a difference! What a breath of fresh air your words are! I have recently let go of some of this chasing. Chasing that had no end in sight. Always more to learn, more to know, more followers, more of less. Goodness, the feeling was one of the “Hungry Ghost”. I found myself chasing someone elses idea of success and feeling like a failure as it never ends and it never satisfies! Since refocusing on my practice and the people I serve day in and day out, I have made some new real and deep contacts both online and off. In hindsight the chase was taking me in the wrong direction-fast-away from my hearts desire. My web presence or writing may not be worthy of being AList status and I am so happy to be back on my humble, peaceful, joyous path (and so are my clients). Mahalo nui loa for recgonizing the truth of the shiny new trinket and sharing it with us! That is fantastic! No chasing required indeed, although sometimes our minds have us thinking that it is. In life, many people spread themselves out too thinly. They take up programs, courses and extra commitments to give them the impression that they are working towards something, when in fact, they are just placing themselves in a more vulnerable position to get burnt out. Yes, we need to focus. We need to concentrate on the things that truly matter – the things that will make a difference and an impact at the end of the day. And most of the time, we already have the resources and expertise to make that happen. What’s stopping us could be as simple as fear or inertia or plain complacency. And I agree that focus does wonders to our lives and the things around us – a multi-directional sprinkle gives us a nice bath; a directed stream from the supersoaker rifle drenches us; a focused water jet cuts through steel. I couldn’t agree more, Dominic. Fantastic analogy, btw.